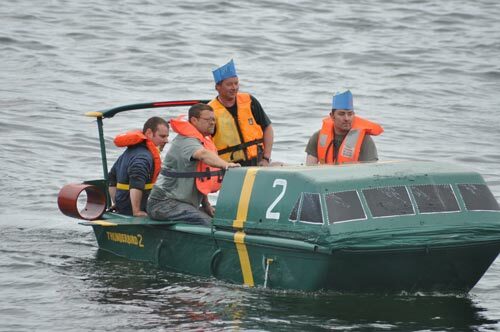 The 2010 Rousay Raft Race Winner (pictured above) was the Thunderbird 2 raft. In the annual race, held today, Saturday, participants must get their rafts from Rousay Pier to Wyre Pier and back again. Five rafts were scheduled to start the race, although the 'Miracle' raft, from Egilsay, unfortunately sank prior to the race beginning. Of the remaining four rafts, the "OOTmaWAY Suckers" raft was unable to cross the finishing line, after fustratingly breaking down on its way back to Rousay, despite being in the lead at the time. Thunderbird 2 subsequently overtook OOTmaWAY Suckers, to come first. The ladies' impressive raft, The Mean Machine 00, from the cartoon, Wacky Races, came a deserved second, with the ladies dressed as characters from The Vulture Squadron - the crew in the Dastardly and Muttley in their Flying Machines series - as well as Wacky Races' 'Penelope Pitstop'. The excellent raft based on characters from the film Shrek came third after encountering difficulties on the way back to Rousay. The raft race forms part of the annual Watersports day event, which raised over £1,000 in total for the RNLI.